Wow, that looks like a pretty handy tool. Would definitely be switching to publisher for all my work if it could do that! Till now I used Pageplus, where I can define the number of rows, columns, the column gap et cetera. I was dissapointed that these options are not there in Affinity Publisher. So far, that's my only remark. Publisher is very nice to work with. I was going to post a request for this exact thing, but I'll just add my voice here instead. A simple way to create column and row guides is a must. I actually spent quite a long time trying to find the settings because I assumed they simply had to be there already. I feel like the Text Frame settings (View > Studio > Text Frame) are also a bit buried given how important they are (as the only way to easily manage columns). The option to create a grid with basic margins/columns/gutters should be front and centre, probably presented when you create your new document. Am I missing something, but doesn't View>Grid and Axis Manager... do a reasonable job? Not for columns, no. It’s great if you want a grid evenly spaced from the spread origin. But it won’t divide the page into equal columns with gaps between them. As said above: "The option to create a grid with basic margins/columns/gutters should be front and centre, probably presented when you create your new document." Without this Affinity Publisher is ruling itself out of news and magazine markets. I also spent quite a bit of time searching for how to create a column and gutter grid. I ended up just creating a master page with the guides I needed. that will have to work for now. I´m an editorial designer, and for me creating, managing and rearranging guides is basic, I found that even Illustrator lacks this and the only software I use which has this right is InDesign. I hope that Publisher and hopefully Designer as well might benefit from devs having this reconsidered. I have seen the tutorials for Publisher and I found it crazy when the instructor just dragged guides out from the rulers by the eye. Professionals don't work like that, we set up guide systems in a rational and exact way. You can see this in the "master pages" video tutorial for Publisher. I know you can do this via the guides manager but it is one guide a the time right? or maybe I am missing something. I -as many who are interested and suggesting stuff- hope Serif and the Affinity line can work things up to the level where there is no Creative Software Monopoly. At this point I very interested in the Feedback from Serif and the Puplisher Team, what is they opinion ? Is there any reason that it isn't implemented and is it planed to implemented? No need so be so dramatic. There is more than just one way to skin this particular cat. I don't think that inDesign way is the only right way. I can envision guides to be saved as presets and you can call any precent you want on a given page or even better associate a given set to a given Master Page. No need to think in terms of layers as per inDesign way. But it won’t divide the page into equal columns with gaps between them. Turn off Use Automatic Grid, set Mode to Advanced, turn off Uniform, and use the Spacing and Gutter settings in the appropriate axis (first axis defaults to horizontal/columns, second to vertical/rows). How do you set the origin point of the grid to be the top left of the margin instead of the top left of the page? How do you get Publisher to automatically calculate the spacing and gutter you need in order to divide your page into two columns? Or three, four, etc? Sadly we can't. That is if I am interpreting correctly, do you want a mirrored set of Left and Right pages? We can only have the one origin point and that is on the far left of the spread not the gutter. Basically, what I am trying to say is that this is not the last word from the Affinity devs on how Affinity Publisher is going to handle grids and ruler guides. Version 1.7 already overhauled the grid system compared to 1.6 (looking across the suite) but lack of ability to specify an origin point is a significant omission. EDIT: I stand corrected. For some reason I was thinking they had changed more than they have in the grid system... actually looks fairly similar. I can envision guides to be saved as presets and you can call any precent you want on a given page or even better associate a given set to a given Master Page. No need to think in terms of layers as per inDesign way. Saving guides on a preset would be great. Hi, I’ve read through most of the posts and i really would love to have a grid system built within the programme too. But, as thats not happening (if it ever will) i did some digging round to find something to help create a template for me so i could at least upload it into Inifnity. It’s a nice simple little webpage - you can download the created template and then upload into infinity. I traced over the image with the grid lines. This software appears to be the sort of approach to grid and column layout that is required. Sadly, the beta program is now closed. Having a single software program that creates precisely what is required is probably more useful than having any jack of all trades software solution. For me, I really like the direction Affinity Publisher has taken. I don't happen to have any legacy files in other publishing software. I will happily use Affinity Publisher for all my layout work and send a PDF file to the printing house. "Designers must be able to explore the consequences of grids visually—not just in code." Hi, thank you for all the contributions in this thread. We hope to have a Grid Guide system fairly soon. When it lands, please let us know how you get on with it. Good to know, thank you. There is a world of difference between bloatware and a software development that is responsive to the user base which contains everything the user base requests. This is a tough ask, considering where Serif started from and the current and pre-existing state of the market. Well done Serif! The endless requests to the dev team are likely to be... well, endless. The triad of software produced under the Affinity banner is a fantastic achievement and (as expected) the software is improving with every update and iteration. i did some digging round to find something to help create a template for me so i could at least upload it into Inifnity. That is a good helper. It is very easy to set up a grid of choice, download and import the PDF into APub and use it as a seperate Master Page. 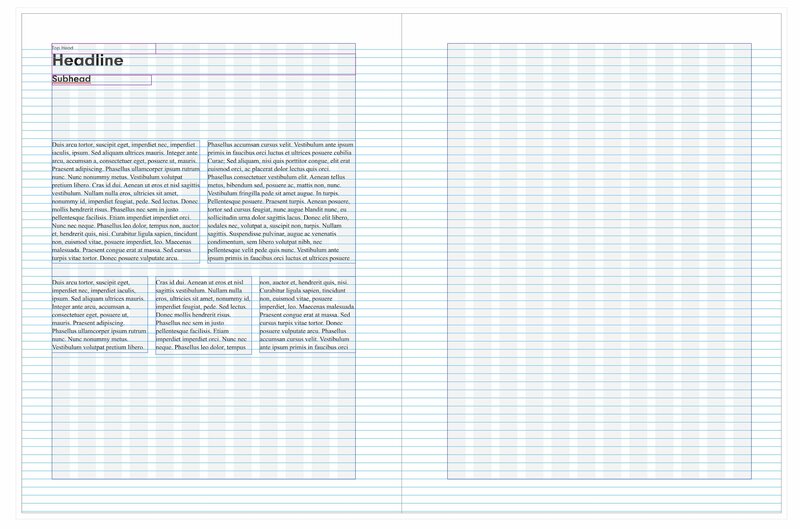 The Grid is a must for professional work, I agree. InDesign idea of creating columns and margins is all I need. And after that, I usually take "Create guides" function.